What do you do before you smoke a cigar? 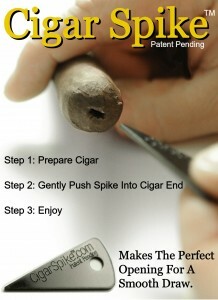 Normally, we use a cutter to prep that nice juicy stogie, but have you heard of the Cigar Spike? Itâ€™s a new product â€“ a cigar tool â€“ that somewhat looks like a guitar pick. And its purpose? To punch a neat little hole at the end of your cigar so that you can start enjoying it. The norm is to use cigar cutters like a guillotine cutter, which will chop of the whole head of a cigar. Another tool that is commonly used is a puncher, which will etch a hole at the end of the cigar. The hole is usually the size of a BB pellet. Enter the Cigar Spike. It is made of plastic, with a pointed end. In order to use it, you push the sharp end down into the head of a cigar to create a hole. It is very easy to use and quite cheap as well. They are selling it over at their web site for $2.99 for 3 pieces. You can choose from several colors â€“ black, orange, blue, and green. I am sure that I got your attention at the price. It is VERY cheap! But how does it fare? I havenâ€™t had the chance to use it myself, although I would have to say that the idea is cool. Then again, from what I have been hearing from those whoâ€™ve actually used it, you have to make sure you do it properly. Otherwise, you can end up with a cracked cigar. Thatâ€™s the downside. Still, it could make for a nice gift this Christmas.